Chloe George gives us another very good reason to attend the pro-choice protest in London on Friday. This is a guest post by Chloe George. Chloe is 29 and works for a charity as an online editor/social media coordinator. She lives in Hackney, East London and blogs as Woman on the edge of time. Her twitter ID is @misschloeg. I spent a few hours on pro-lifers websites on Friday afternoon, and I learned that, as well as being busy posting hideous propaganda to bully and intimidate women, they have really bad taste in fonts. Comic sans, purple and pink text, images of soft-focus women crying after abortions or leaping through cornfields when they chose not to terminate their pregnancy – it really makes you wonder how hard it is to provide pleasing aesthetics to your ideological war. “SHOW ME HOW DEVELOPED MY BABY IS NOW”, a link screams in nasty caps. OK then! I did. It looked like a foetus. Some pseudo-medieval style font has thrown up all over the “The Pope’s Letter to Women Who Have had an Abortion” page, and the text is squeezed next to a squashed picture of the Virgin Mary. At least they could have the decency to sort out the dimensions? All this bothersome inconsistency in design is another reason why this week’s pro-choice protest at the Bloomsbury British Pregnancy Advisory Service (BPAS) clinic is going to be a good one. The protest has been organised in response to an evening vigil with Bishop Alan Hopes, organised by anti-abortion group 40 Days For Life. 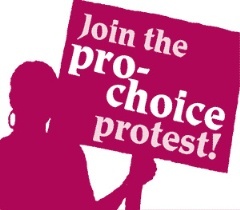 Bloomsbury Pro-Choice Alliance say: “come along, let’s have a bit of a party! Obviously it would be a terrible shame if we were to disrupt 40DFL’s vigil, however I think that’s a risk we’ll have to take”. People have been donating money for each day the 40 Days for Life vigils continue, reducing BPAS staff to tears. Not only does the pro-choice movement have better taste in visual design than the pro-lifers – it’s also much more fun, and much nicer. Come along this Friday and we can politely tell those at the vigil that we don’t need their po-faced prayers, thank you very much – just a bit of freedom, dignity and choice for women will do. And a user-friendly website and some Helvetica wouldn’t go amiss, either. Donate to boycott 40 Days for Life here. Good piece, and hope to see you on Friday!